Earn up to 392 reward points. Extremely accurate drum replacement plug-in tool. SLATE DIGITAL's TRIGGER is the next generation drum replacement VST/RTAS/AU plugin. TRIGGER has a phase accurate multi layered triggering engine. This means that in one instance of the plugin, you can seamlessly trigger multiple samples simultaneously such as a close mic sample, stereo overhead sample, and a stereo room mic samples. Or, mix many direct mic samples to develop your own custom unique sounds. This multi channel triggering functionality allows the user to recreate the sound of natural drums with real multitracked samples. Each sample layer has parameters for customization such as velocity and dynamic control, attack, sustain, release and independent levels. 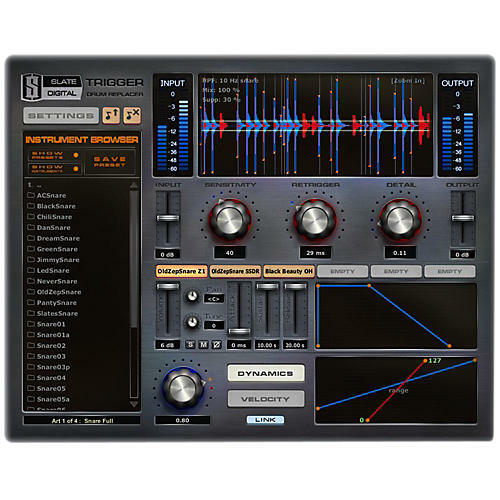 Other features include 2 detection modes, MIDI in/out, automation of detecting parameters, up to 127 different articulations per instrument, up to 127 velocity layers per instrument and up to 127 alternation hits per velocity layer, and a unique "Leakage Suppression" function. TRIGGER Platinum instrument library contains more than 2.3 GB of high-quality 24 bit samples compressed using TRIGGER lossless sample compression (6 GB uncompressed). TRIGGER Platinum instrument library includes: 46 snares (including 2 high-detailed Deluxe snares with adjustable overheads and 12 alternation hits per each velocity), 33 kick drums (including 2 Deluxe kick drums), 8 sets of toms. Need a new drum sound without recording new drums? Download Trigger Platinum today.